I�m not known for my pithiness, am I? Well, just this once I intend to try, for the sake of those desperate to get on with their Christmas shopping. However, just to be on the safe side, I�m putting my conclusion up-front. This book is unusual in content, candid to a fault, thoroughly absorbing, moving and mirthful, and requires virtually no prior knowledge of - or even particular interest in - "symphonic" music. Moreover, whole swathes of it read like a novel, and the cost/content ratio is vanishingly small. So, what�re you waiting for? Before we � that is, I and anyone not already making a beeline for the bookshop � go any further, I must make a solemn declaration. I hereby swear that I have not been swayed - well, not much, anyway - by the fact that both the author and I hail from the West Riding of Yorkshire. Come to think of it, though, this does raise a particularly pertinent point: Yorkshire folk are renowned for not being backward at calling a spade a spade. The reason for telling you this will, I hope, be clear by the time I�m done. What we have here is essentially a singularly intriguing autobiography, whose narrative is interspersed by a number of "divertimenti". Basically, instead of sticking strictly to chronological sequence, certain topics - which would otherwise pop up piecemeal � are dealt with more fully as and when they first arise. I like this approach, for exactly the same reasons that I enjoy musical divertimenti. The technique is elegantly managed: as the tale nears its end, so the narrative, just like the proverbial "old soldier", fades until, just like Tchaikovsky�s Sleeping Beauty, all that remains is divertimento. The subject matter is potentially controversial, or at least might be so-regarded in some quarters. 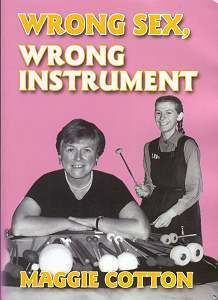 That�s because this is not the tale of just any Yorkshire lass, but of the gritty Yorkshire lass who became the UK�s first female professional orchestral percussionist (not, you understand, to be confused with timpanist!). If this seems fairly hum-drum, then bear in mind that Maggie was born in 1937, in an age when sexual "equality" was limited to women having the right to vote, and when the job market - and pretty well anything else you care to mention � was firmly divided into boxes labelled "for the boys" and "for the girls". In those days, unless they were truly exceptional players of acceptably "feminine" instruments, women were rarely admitted to any orchestra, never mind overtly masculine bastions like the Vienna Philharmonic. The binding thread of her narrative is her continual battle against what we would now call "prejudice", although historically it might more accurately be called "misperception". This theme is encapsulated in Maggie�s title, extracted from something said to her very early on (see p. 39!). Given that titular prominence, it doesn�t take a genius to figure out that, to a large extent, this must have been the spur that drove her on. Maggie, quite properly, starts at the very beginning, painting a vivid picture from her rich palette of childhood memories. I was fair brought up short to find how much of this matched my own memories � nothing much had changed in the ten years that separates our birth-dates. Incidentally � and this is as much of the plot as I�m going to let out of the bag! � it wasn�t only lasses whose winter wellies gave them red chap-lines across the backs of their knees. Back then, as I recall it, not even lads had the option of long pants. Slowly but surely, with that same graphic skill, Maggie paints her growing dream, embroiling you in her seemingly life-long battle to achieve, and then consolidate, her ambition. Even though we already know the outcome, the fact that the odds were stacked against her every bit of the way clearly contributes to the novel-like impact of the narrative. Yet, there is far more here than mere description. There is something else, which for me sets this account a notch above many an autobiography, and a world away from your run-of-the-mill "kiss and tell" whistle-blower. That something is an uncommon degree of empathy with and awareness of the motivations behind people�s behaviour - including her own! To my mind, this is where Maggie really comes up trumps: even when she is dealing with people on their very worst behaviour, she does so with such immense fairness and understanding � excepting, of course, when that behaviour is utterly incomprehensible - that even the most curmudgeonly can have no cause for complaint. This really comes to the fore when Maggie is talking about her career with the CBSO, and even more so in her account � which is both heart-warming and hilarious � of her educational adventures, both with underprivileged and (especially) deaf children. I am not ashamed � nay, I�m pleased - to say that on more than one occasion this last brought a sizeable lump to my throat. There is perhaps no field of human endeavour where more people are simultaneously working, in more distinct capacities and with greater precision, towards achieving a single goal, than the professional symphony orchestra. When you think about it, you do get to wondering how it is kept from exploding, how it can work at all - never mind work so consistently well. The main reason is the military discipline of the "system" in which, if a trooper steps out of line, he will in effect "be taken out and shot at dawn", and players speaking their minds are not � shall we say? - encouraged. That players � but not, it seems, conductors and management � are "gagged" by their contracts is only part of the complex disciplinary régime that Maggie dissects, exemplifying and elaborating on the workings of the internal organs of the orchestra. And yes, inevitably there are explosions, disastrous breakdowns in human relations, along with the sad consequences � though she mentions only one that actually happened in public. It almost goes without saying that there is also much merriment � in reading some of Maggie�s multitudinous anecdotes, you run the risk of falling out of your chair laughing. It is evident that Maggie had something of a love/hate relationship with Simon Rattle, under whose baton she spent nearly half of her forty-year long CBSO career. Sometimes, metaphorically speaking, they were at each other�s throats, at other times, quite literally anything but � just read about Simon�s involvement with the deaf children! Experiencing, albeit at Maggie�s evocative second-hand, the many conflicting forces � including both political and inter-personal - at work serves only to strengthen our admiration for the robustness of the magnificent organism that is the professional symphony orchestra. There is more � far, far more. Maggie goes into what seems like a million and one allied topics, ranging from international crises right down to general horse-work, social and family matters, even unto the best place to catch a quick "kip". Yet, nothing seems superfluous because, whatever she�s talking about, Maggie remains so engaging that the pages just fly by. Moreover, such is the eloquence of her style and the sheer quantity of information, this is a book that will happily bear repeated readings. One rule of criticism that I learnt from the late Adrian Smith, the sole dedicatee of this book, was "never finish on an adverse comment". For once, out of sheer Yorkshire cussedness, I�m going to break that rule. So far, I haven�t mentioned any minuses, not so much as a single one. Yet, there are some. There are a few little patches where I got slightly muddled by the phraseology, a couple of homonymic bloopers, and I would have liked some parenthetical dates against events described during those divertimenti, as just occasionally I wondered if "X" had happened before or after "Y". But, that really is about it, other than feeling that, even at 364 pages, the book was too short! I suppose you could say that this is "praising with faint condemnation". Well, if so, then so be it. So, buy it!